Chief Rita M. Smith was born June 10, 1918, to Frank and Mary Tony (Bradford) in Wolfville. Unfortunately, Canada at that point in time was not a friendly place of residence for a Mi'kmaq. Civil and human rights for Natives, women, and others who had second- and third-class citizenship, was still mostly in the dream stage. From growing up in such a social environment, Rita developed in youth a burning resolve to claim and know the same citizenship privileges as those enjoyed by white male Canadians. During the mid-1930s, Rita became engaged to Abraham Smith; they were married on June 1, 1936. When she passed away on October 27, 1996, they had been married for just over 60 years. The marriage produced nine healthy children. 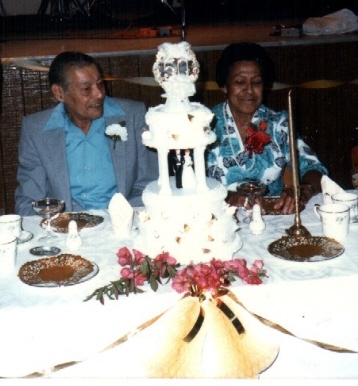 Raising and educating children in a racist society was, for Rita and Abe, no easy task; their stories of hardship would fill several columns. However, suffice it to say they overcame the pitfalls and were largely successful; most of their children are well-educated and have established for themselves financial independence. Rita's first major clash with an uncaring Indian Affairs bureaucracy occurred in the late 1940s. The cause was the Dept. 's slow response to an application she and Abe had made for housing assistance. The insensitive bureaucracy was in for a surprise; it was about to tangle with a woman who rarely accepted defeat. This is the gist of the story: Abe, a veteran of the Second World War, was entitled to housing assistance under the old Veteran's Land Act. But when he applied for assistance to build a decent home on Horton Indian Reserve, he was given the old bureaucratic run around. Rather than labour to squeeze into this short column an epic tale of how to defeat bureaucratic obstruction by determined persistence, let’s just say that by the time Rita got through with the Department's troops, the Smiths had their home! 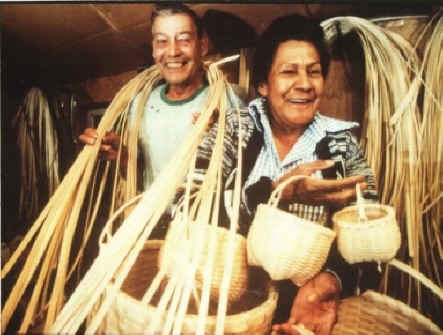 During this time, to support their family, Rita and Abe involved themselves in the art of basket-making. With the passage of time, their artistic skills finessed to such an extent that they became known as "the finest Mi'kmaq basket-making team in Nova Scotia." The best known of their efforts is a set of six apple baskets, dubbed the "Birds Nest," crafted to fit inside each other. When, because of illnesses associated with age, they gave up basket-making in 1986, the set was retailing for $1,000. Rita and Abe presented me with a gift set in appreciation for the times I went the extra mile in helping them resolve band-related problems - it is among my most prized possessions. A set purchased by Indian Affairs in 1985 is now part of its Indian and Northern Affairs' National Art Collection. It, with other priceless works of art, is displayed at the Indian Art Centre in Ottawa. Rita was a past president of the former Mi'kmaq Arts and Crafts Society of Nova Scotia. The dedicated contributions she made towards enhancing and preserving Mi'kmaq culture during her term, and through her lifetime efforts, are fondly remembered. In 1969, Rita ran for Chief of the Annapolis Valley First Nation community and lost. Not satisfied with the results, she lodged an election appeal and won. To say the least her three terms as Chief of Annapolis were at times stormy. However, she proved to be a leader who got things done. She demonstrated that she would not be intimidated or shuffled aside by male Native politicians because of her gender. One of the best stories I've heard in this regard was the time she and another Mi'kmaq political activist, Racheal Marshall, believing they were being left behind by male Chiefs and Union of Nova Scotia Indians officials who were planning to attend a meeting in Ottawa, hopped a plane and were in the Capital to greet them when they arrived. During her last term as Chief of Annapolis Valley, Rita, with her usual stubborn tenacity, undertook to realize a dream of seeing Horton become an independent First Nation community. In this regard, after several years of fighting, she met with success. On June 6, 1984, Horton was separated from Annapolis Valley and became independent. Rita became its first Chief. During this time she became a member of the board of directors of the Micmac Friendship Centre in Halifax, and remained so until her death. Also she was a founding Chief of the Confederacy of Mainland Micmacs, and was for several years a board member of the UNSI. Rita, enjoyed debating as I do. Sometimes, when visiting and things were to quite, I'd deliberately bring up a subject that would get her dander up. If this didn't work, there was one that would - I'd call her Maude, a second name that she had a particular dislike of. These visits and heated debates were a delight, from my perspective - although she probably thought otherwise. However, after she developed serious heart problems, they had to be discontinued. Based upon what I've related, one might be tempted to categorize Rita as militant feminist. She wasn't. To describe her as such would not do justice to the woman she was. Above all, Rita was a wife and mother who was justly proud of the successes of her children and of her home-making abilities. As a housewife, she enjoyed her kitchen and kept her house spotless. Because of her green thumb, the gardens around the Smith house were abundant with flowers. She was a woman who could live with and enjoy the fruits of being a woman, but she demanded that her male peers extend to her the same curtsies they extended to one another when conducting political and business matters. On a personal basis, Rita was a loyal, dependable and trustworthy friend, always there when needed. May the Great Spirit grant the soul of Rita, a beloved and sadly missed wife, mother, and friend, a peaceful eternity in the Land of Souls!